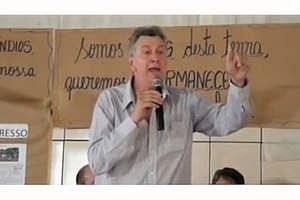 A prominent Brazilian congressman has received Survival International’s ‘Racist of the Year’ award on the International Day for the Elimination of Racial Discrimination, 21 March. During a public meeting last November, Deputy Luis Carlos Heinze made deeply offensive remarks against Brazilian Indians, homosexuals and black people. Another congressman, Deputy Alceu Moreira, called for the eviction of tribal people attempting to reoccupy their ancestral lands. Watch a video of their speeches. The Deputies are part of Brazil’s powerful anti-indigenous farming lobby, which is pressurizing the government to pass a series of controversial laws that would drastically weaken Indians’ control over their lands. APIB, the Association of Indigenous Peoples of Brazil, described this in a letter to Brazil’s Minister of Justice, as ‘a deadly campaign of discrimination, racism and extermination of indigenous peoples’. The changes would be disastrous for Brazilian tribes such as the Guarani, who have already lost most of their land to cattle ranchers and sugar cane plantations. The tribe faces high levels of violence at the hands of powerful landowners, who frequently employ gunmen to evict the Guarani from their land and assassinate Guarani leaders. US food giant Bunge, which buys sugar cane from land stolen from the Guarani, has reportedly been funding Deputy Heinze’s electoral campaigns. Survival’s racism award has previously been awarded to the Peruvian newspaper Correo for calling indigenous Peruvians ‘savages’ and ‘primitive’, and the Paraguayan newspaper La Nación for comparing Paraguayan Indians to cancer, and calling them ‘filthy’.